It was amazing just walking into the Pittsburgh ComiCon that day, as there was a buzz in the air about Magic. People were trading in the halls, battling on spare tables, and talking about the game everywhere. I soaked it all in. The event I was there to participate in, though, turned out to be less-than-spectacular from my point of view. It was Fourth Edition-Fallen Empires sealed deck (Fourth had come out recently), single elimination. There I was, ready to start beating down with my hand-made behemoth: Hurloon Minotaur with Holy Armor and Firebreathing on it, plus a counter from a sacrificed Armor Thrull. It was 3/7 and could be pumped on both offense and defense. My first-round opponent casually played out his fourth white creature – I believe it was Benalish Hero – and tapped them all to remove my Minotaur from the game with his Hand of Justice. I never saw it coming. My roommate Jake, however, did significantly better than I did, and was playing in the round before the prize cutoff. I watched over his shoulder as he struggled to deal with a Drudge Skeletons enchanted with Lure that was clearing the way for all of his opponent's other creatures to hit him. Jake had a Psionic Entity in play, and his opponent was only at 4 life, but the Entity alone couldn't finish the job. Jake never realized that the Death Ward in his hand was just what he needed to win. I did, and let him hear about it afterwards. I took it much harder than he did. So that was my first taste of tournaments, I got crushed through some combination of carelessness and inexperience, but I wanted more. 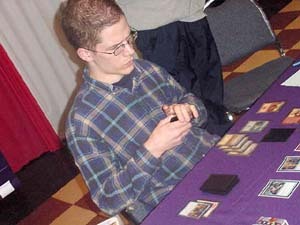 I started attending whatever little local tournaments I heard about, in card shops, malls, libraries, you name it, often with Jake, sometimes with other roommates, sometimes with other guys I played with at Pitt or the Comics Crypt. All the while I was still playing casually at home and at the Union every week, and still spending all my money and time on the game. I distinctly remember one stern talking-to that I got from Anne, as I sat in my dim, dingy apartment sorting out Homelands commons. "You can't keep wasting your time like this, skipping class, staying up late, spending money you probably can't afford to spend. It's ridiculous." Two things happened shortly after that first tournament that really helped me grow as a player. One, guys like Andrew Cuneo and Erik Lauer started coming to Pitt's Magic Night from nearby Carnegie Mellon University, a private institution where all the really smart kids went. The crowd at CMU (way before Randy Buehler or Mike Turian were in the picture), while still mostly casual gamers, had made great progress in the area of making decks that did nothing but win one-on-one duels – they were very good at identifying and exploiting broken cards, and would come by to show off / beat the hell out of us with whatever new weapons they had constructed, as well as join in our multiplayer games with less serious decks. Two, the Arena League started up at the Comics Crypt, giving me and my shopmates a nice, low-key Organized Play outlet. I held onto my original DCI card for a long time, the back plastered with Arena stickers. I became one of the best players in the store, mastering such formats as "Fourth Edition Continuous Draft" and "Standard with Vanguard." Sadly, my collection of oversized prize cards was donated to a friend before I moved out of Pittsburgh. The Ice Age block came and went, and I continued dabbling in local tournaments. I came in second in a Type 1 (now called Vintage) event with a Necropotence / Zur's Weirding / Ivory Tower lock deck long before anyone had figured out a "good" use for Necro. My deck was full of Moxes on loan from some of the Student Union crowd, and at that event I first met a very young Mike Turian, beating him in both round 1 and round 2 of the event (long story). I also won a Black Lotus in an Ice Age/Alliances Sealed deck event that was played using ante; the Lotus was stolen from my backpack years later along with a growing collection of old-school power cards, cards I have never replaced in my collection. I won an Unlimited starter deck in another similar Sealed event at a local game convention. (I of course opened it, hoping to find expensive cards within, only to be greeted by a Nevinyrral's Disk and a Kudzu as my rares. The common Sinkhole made up for it a little bit.) I played in my first Regionals tournament with a slightly more traditional Necropotence deck, although my result was not memorable. The other noteworthy event during that block was that Wizards started the "Professional Tour" for Magic – something Jake and I noted in a magazine ad as being cool, but probably nothing we'd ever be able to do. In the summer of 1995, I somehow managed to graduate from Pitt with a BS in Chemistry; no longer being in school did wonders for the amount of time I had to devote to Magic in good conscience. Jake and I moved out of the university district into a big house in the suburbs with four other buddies, two of whom were also Magic players. Thus, Mirage block marked the steepest point in my learning curve. My roommates and I would drive to Ohio each time a new set came out to attend the prereleases; no such events were held in Pittsburgh yet. Jake made the Top 8 in the Mirage one and was given a framed certificate of which I was extremely jealous. I made the Top 8 in both the Visions and Weatherlight events, but sadly was never given any certificates of my own. I played in my first State Championship – a Mirage Sealed deck tournament in Philadelphia; my buddies and I all crashed at Andrew Cuneo's parents' place. 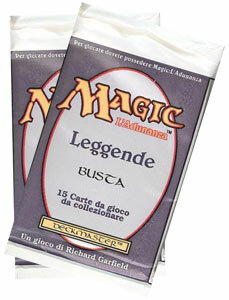 I drew myself out of the Top 8, but the guy I drew with gave me a couple of his Italian Legends prize packs as a thank you. I was living the lifestyle! It was during this time period that Randy Buehler showed up on my radar. He was a grad student at Pitt, but he played Magic with the CMU crowd almost exclusively and was hellbent on qualifying for the Pro Tour. The CMU crowd kind of coalesced into a more focused unit around him, a unit that most of us that still played at Pitt didn't like all that much. They started showing up to all the local events and typically did well, while my Pitt pals and I hovered near the middle of the pack. I played in the local PTQs for every format that year – Extended with dual lands, the bizarre Fifth Edition/Visions Sealed deck, and Mirage Block Constructed – as they were the biggest tournaments in town, regardless of any actual intention of trying to get on the Pro Tour, and never came close to a Top 8, whereas Buehler and his circle seemed to be in contention more regularly. I wouldn't say Pitt vs. CMU was an outright rivalry, but we always felt like we were competing against them first, everyone else second. Although I never made a PTQ Top 8 that year, I took great joy in winning a local Gray Matter $1000 tournament, a multi-format event, coming out on top against a Top 8 that included Cuneo, Lauer, and Buehler. As I walked out of the hotel ballroom that held the event, check in hand, the three of them were sitting on a couch in the lobby. Buehler offered to "play me right now for the money." It cannot be said that the man is not competitive! I taped a photocopy of that check on the living room wall of our house. The year that Mirage was in print also marked the first North American Grand Prix, held in Washington, DC. My roommates Jake, Jim, and Jeremiah, as well as Comics Crypt owner-turned-Magic player Scott Teamann, drove to the event and spent the weekend playing Magic. We were all quickly dispatched from the main event, but had a blast in side tournaments, and enjoyed seeing many of the players we'd read about in The Duelist and Sideboard, players like Shawn "Hammer" Regnier, Mike Long, Dave Price, and Dennis Bentley. Like a true fanboy, I took a bunch of pictures at that event – of the venue, of artists (Alan Rabinowitz and Melissa Benson, thankyouverymuch), of my friends, even a couple of myself, such as the one here of me registering my card pool. My, how brown my hair was back then! Four months after the DC event, there was another Grand Prix scheduled in Toronto, and my posse and I discussed making the trip. In the end we decided against it, and were surprised when we heard the results of the event – three of the local-yokels from the CMU crowd – Lauer, Turian, and this quiet kid named Dan Silberman – all made the Top 8. Impressive. Scott: "Did you hear who won the Pro Tour in Chicago?" Scott: "Guess. Just guess. No, you'll never guess it." That news really gave me the feeling that anyone, especially me, could do it, could play on the Pro Tour and do well. Of course, history shows that Randy Buehler is one of the finest minds to ever play the game, put together a Hall of Fame-caliber resume in record time, was an influential enough force in the game to get policies changed before he even got a job at Wizards... not to mention the fact that he did get a job here, rose up the corporate ranks like a meteor, and masterminded essentially an entire new department for the company while still directing all of Magic R&D, all of which says nothing of the talent he surrounded himself with in those early CMU days. I have started and deleted a piece on the three fundamental ways to approach the game, called "The Buehler/Lauer/Turian Triangle" several times over the past half-decade, and may never get around to writing it now that I work with all of them. 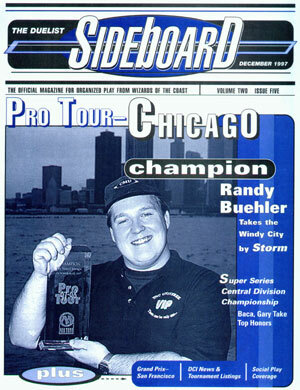 Back then, Randy was just some over-competitive guy that we didn't really like or respect all that much, and seeing that guy win a Pro Tour sparked my own desire to succeed at the game like never before. When the next big set, Tempest, was released, Pittsburgh had its first prerelease. Attendance was huge. My roommates and I all went, my brother drove in to play, and the CMU gang were all there, led by Randy, still glowing from his recent Pro Tour success. I made a statement that day by winning the event (there were no flights or drafts back then, just one monstrous prerelease tournament), beating Turian in the Swiss and Silberman in the finals, and continuing my string of prerelease success. (Buehler landed somewhere in the Top 16.) I got a couple boxes of cards and a full set in a binder for my troubles, but no trophy, a detail that irked Jake and, later, Anne much more than it did me. I wasn't even jealous of Jake's Mirage certificate anymore by this time. "You won a tournament that big and there was no trophy?" Anne asked me. To rectify that injustice, Jake and Anne pitched in to have a trophy made for me – a nice tall thing, inscribed: "Aaron J. Forsythe / Tempest Prerelease / Pittsburgh, PA / October 4, 1997." Wow, almost ten years ago. That trophy will be on display prominently in my new office. A few months later, Stronghold was released and once again Pittsburgh was without an event, so we packed up the gang and drove to Columbus to play there. My prerelease luck ran out – I was trounced – but I made up for it in the all-night Limited PTQ that followed, where Scott Teamann and I each made our first Top 8. I was crushed by future teammate and coworker Nate Heiss and his Overrun in the quarterfinals; Scott befell a similar fate at the hands of Canadian pro Gary Krakower. After that brief taste of success, those of us that played at Pitt and were serious about trying to qualify formed a loose team and called ourselves "The Watchmen." Lame, I know. But we had some fire, and we were willing to drive several hours to get to PTQs. Buehler was setting the world on fire, winning Grand Prix – Atlanta and putting up high finishes in similar events in Europe. CMU was becoming a powerhouse in the Magic world, and those of us at Pitt stood to benefit from Randy's networking. One week Pat Chapin and Eric Taylor would be in town to play in some local Type 2 event, the next week Randy was bringing Jon Finkel by the Pitt Student Union looking for a draft. We had come to see Randy for what he was – an awesome player – and because of that we were given a lot of great opportunities to learn. 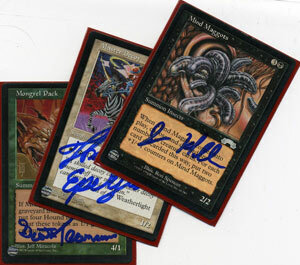 Cards from my GP Indy Sealed deck, signed by my teammates for good luck. After Exodus came out, the Watchmen embarked on a trip to Grand Prix – Indianapolis, another Sealed Deck event. I had three byes thanks to my rating, juiced from doing well – but not quite well enough – at the season's PTQs. I was nervous as I expected to do well, and was less than pleased that my round-four opponent coming off the byes was Erik Lauer. Things started off wrong when I drew eight cards to start the match, but Erik recognized it as an honest nervous error and declined to call a judge (not the right way to handle it, as it happens, but we didn't know that at the time). I believe I won the match on the back of Ensnaring Bridge. I continued to do well that day, putting up a record good enough to advance to Day 2. For as good as I'd gotten and Rath Cycle Sealed that summer, I couldn't draft my way out of a paper bag, and was beaten into the ground by all manner of more competent professional players on Day 2. I still have those draft decks in a shoebox, and they are laughable. Buehler, of course, finished 5th, and Turian 24th. For me and my teammates, however, it was back to the PTQs. In retrospect, playing in Ohio Valley PTQs when I did was an amazing experience. The events I played in were run by giants of the industry – Jeff Donais, who eventually became Wizards' DCI Manager before becoming the head of Upper Deck's R&D department, and Mike Guptil, one of the premier TOs – if not the premier TO – in the U.S. today. The player community was large, friendly, and generally very, very talented. 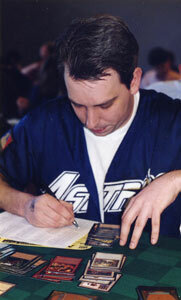 The names I'd have to battle every weekend were ones that ultimately showed up in Grand Prix or Pro Tour Top 8s – Tim Aten, John Hunka, Nick Eisel, Eric Taylor, Trey Van Cleave, Pat Chapin, Jason Opalka, Nate Heiss, Dave Weitz, Aaron Breider, Alex Borteh, Jess Means – not to mention the countless talented others, like Mark Globus, who never reached that goal. On top of that, scads of qualified pros would turn out to every event, whether CMU, Deadguy, or anyone else, looking for practice, tech, or just a reason to hang out. They felt like events, and every single one that you made Top 8 at was an accomplishment. No wonder I was so jazzed to wake up early and hop in the car every Saturday. ...But it felt even better being able to go home and tell Anne, Jake, and everyone else in the house that I had finally done it, finally cleared the hurdle I had been trying to jump for almost two years. I had qualified for the Pro Tour. Anne, my Watchmen teammates, and I headed to the local Irish pub for dinner and a few celebratory rounds, and I looked forward to starting a new chapter in my Magic career. Wow, it all comes pouring out. Two weeks from now, I'll tell the last part – the Pro Tour and working at Wizards. Which card with a drawback did you have the hardest time accepting as “good”? I got some great emails on this topic with other examples ranging from Necropotence to Wild Mongrel. I'll have to do a mailbag column soon!